UTWindows CE HMI is the Windows CE version of our popular UticorTouchpanel. It has a 330MHz Alchemy CPU and Windows CE Operating System. 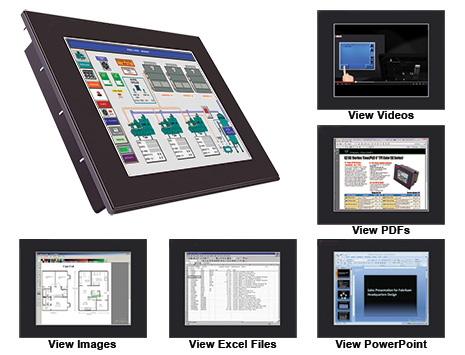 This allows the Uticor Series HMIs to offer Windows Viewers such as PDF, X-cel and Powerpoint. The CE operating system also gives the UTWindows CE Touchpanel a unique ability to play a Training or Maintenance Video, a feature most loved by service departments of OEMs. Even though there are a number of advanced Touchpanel HMIs in the market that have Windows CE as their operating system, they do not bring out the multi-tasking capability of Windows for customer use. These panels like C-more can run only the HMI application. The UTWindows CE Touchpanel is a departure from that thinking. We allow full Windows functionality avaiable to you as the user, and give you the flexibility of using or not using these Windows CE features. The programming software for UTWindows CE HMI is the same as for the UticorTouch HMI which allows complete interoperability between UticorTouch Enhanced which has the proprietary operating system and UTWindows CE Touchpanel that has the CE operating system. Thus any project developed for one panel can be transferred to the other panel. The UTWindows CE Touchpanel also has the same hardware foot-print as the popular Uticor Touchpanel to give the user a seamless transition between both types of panels. The UTWindows CE Touchpanel has all the Enhanced software features of the UticorTouch Enhanced. In addition having windows CE operating system this touchpanel has a unique ability, we call it "Quik Edit". This feature allows field upgrade to the touchpanel screens without need for a PC. The UTWindows CE Touchpanel also has built-in Ethernet & USB besides its 2 serial ports. The UTWindows CE Touchpanel is more than an HMI and it is also more than just a simple CE Touch Computer. It is a unique combination of both. It is like having an advanced SCADA with no limitation on number of tags, yet have the capability of Internet browsing, Windows Viewers and at the same time talk to practically all types of PLCs and industrial networks.